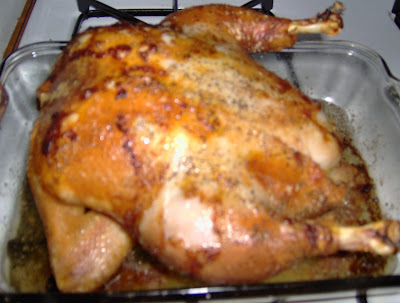 I really think that the best chicken is a flavorful, juicy, whole roasted chicken. This one is a winner. I've tried and tried for years to get this right. I've stuffed with different aromatics, rubbed with oil or butter, trussed it...you name it, I've done it. This is the simplest and best way that I've come up with....and the most delicious. First things first. 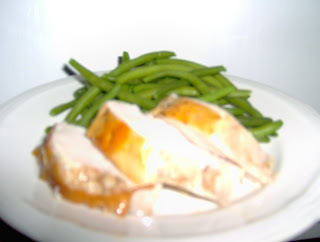 Take out the giblets (save for the dog!) 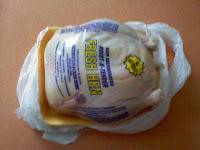 and wash the bird very well. 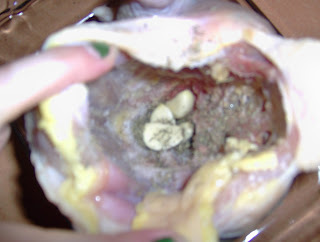 Mr. Trucker LOVES giblets! 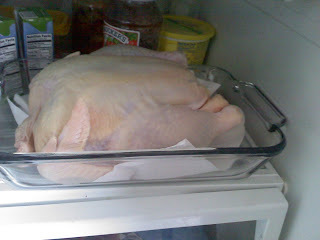 The most important thing is drying the chicken really well. 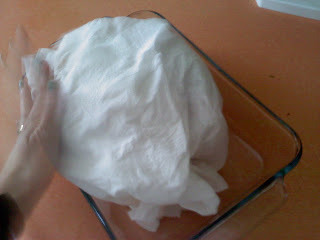 Dry out the inside with paper towels. Pat the outside really dry. I usually do this in the morning so I can let it sit in the fridge for a few hours to dry out even more. Nice visual, eh? Looks like I'm acosting the poor bird. LOL! When you are ready to cook it, preheat the oven to 425 degrees. This sounds hot, but it ensures a crispy, brown skin. 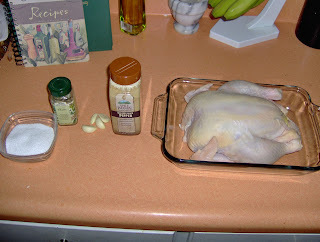 Dry the chicken out one more time, then stuff it with the garlic cloves and sprinkle in the thyme. Sprinkle in some kosher salt too. 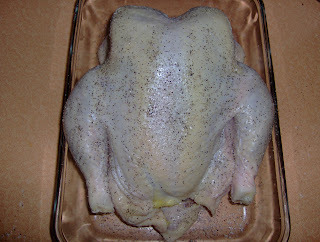 Now sprinkle kosher salt and pepper on the outside of the bird. Fold the wings back so it's sitting on it's elbows. Now stick it in the oven. It'll take 1 1/2 - 2 hours depending on the size of the bird. Use a meat thermometer if you have one (I don't...I should, right?) 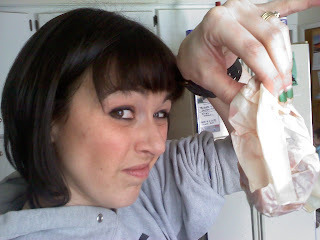 OR you can just make a small slice between the leg and breast...if the juices run clear...then it's done! We just had it with some steamed green beans. It's so flavorful & juicy and deeelicious! I like to carve the breasts off the bone and slice them up so everyone gets a little piece of the crispy, salty/peppery skin. Mmmmmm. 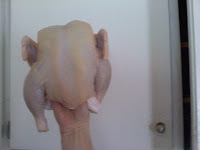 I was watching a friend's little boy today and he's not a big eater...but when he saw this chicken? 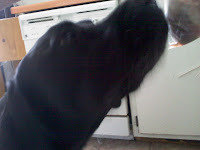 He wanted some! I let him try a piece and he said "Miss Missy? Can I have some more please? That was good!" How could I say no? He ate 2 slices and a serving of green beans. YAY!! !